So, are you in need of a bike rack to travel along with your bike? Sweet! But take note that shopping for a good one might be overwhelmed and tricky. At Bamargera.com, our target is to simplify shopping for you. And in this guide, we will take a look on some top-rated bike racks for cars out there. Besides, is an ultimate guide on how to choose the most suitable bike rack. For more information, just keep reading. 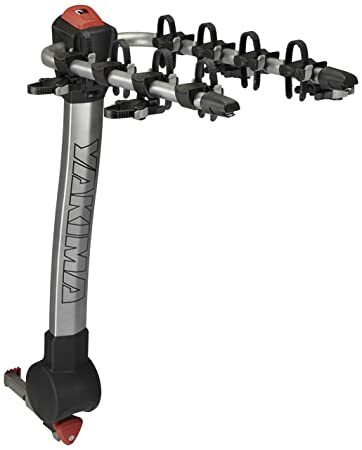 Yakima Products Ridgeback Hitch Bike Rack Hanging 44.8 lbs. 4 bikes/150 lbs. 1.25" and 2"
Swagman XTC2 Hitch Bike Rack Platform/wheel 32.4 lbs. 2 bikes/70 lbs. 1-1/4" and 2"
Yakima Products Hold Up Tray Style Bike Rack Platform/Wheel 49 lbs. 4 bikes/60 lbs. (each bike) 1-1/4” or 2"
Thule T2 Pro XT 2 Bike Rack Platform/Wheel 51 lbs. 4 bikes/60 lbs. (each bike) 2” or 1¼"
Saris Freedom SuperClamp 2 Bike Rack Platform/Wheel 32 lbs. 2 bikes/60 lbs. (each bike) 2” or 1¼"
Yakima Dr. Tray 2 Bike Rack - 2" Platform/Wheel 34 lbs. 2 bikes/40 lbs. (each bike) 2” or 1¼"
The Allen Sports Deluxe is one of the most innovative hanging bike rack on the market. It offers secure mounting for up to 4 bikes. 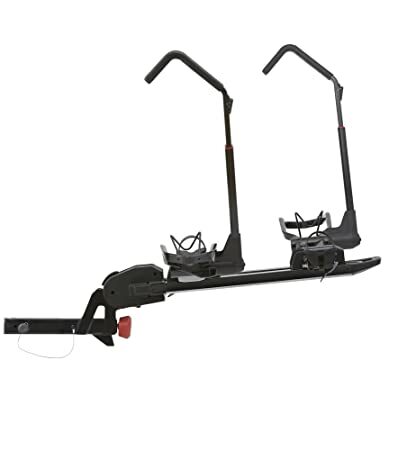 The most interesting aspects of this model are the L-shaped frame that you can slide into the hitch and lock solidly with a nut and bolt. When not in use, just fold the rack down through a convenient pin to access the vehicle rear. There is 22-inch long rack arm to cup safely bicycle and the Allen’s patented tie-down system to protect from contact with its metal rack. Take note that it is only compatible with either IV 2” or Class III hitches. The max recommended weight of this rack is 140 lbs., which means each bike should be less than 35 lbs. Though the rack doesn’t arrive in pre-assembled, it just takes you less than 5 minutes to full installation. Pretty quick and easy. Just don’t try to use it on the front of vehicles or trailers. 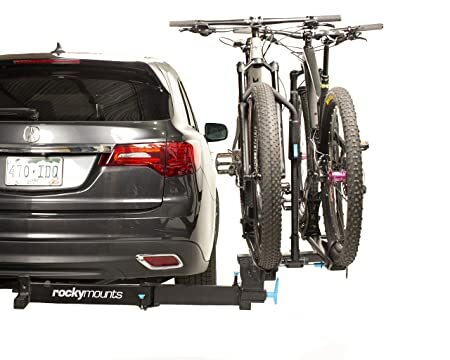 The Yakima Products Ridgeback Hitch Bike Rack might be a bit pricey, it is backed by a lifetime warranty. It features the same rack style as the Allen, but way more compact and lightweight to easily assemble or remove on your own. As you need to install the rack to lock your bikes, Yakima thoughtfully offers a tool-free Speedknob. Plus, is a simple-to-use lever that you can fold the rack up when not in use or tilt it down for vehicle’s rear access. There are four capacity options to fit the number of bikes you need to pack for traveling (maximum are 5 bikes, but require a 2” hitch). Don’t worry that the more you carry, the higher the risk of bike-to-bike contact because of the Anti-sway cradles to efficiently avoid that problem. At the meantime, its removable ZipStrips are good at securing the vehicles to the rack or easily detaching for storage. One of the most interesting features of the Swagman XTC2 Hitch Bike Rack is push-button ratcheting arms. They are grippy, soft, adjustable, and frame-friendly to hold vehicles in place whilst avoiding all metal-to-frame contacts. At the meantime, the foldable center arm helps you with easy access to your vehicle’s rear without removing the rack. Take note that the XTC can support a bike weighing maximumly 35 lbs. for a total of 70 lbs. in capacity. It includes a wheel stirrup on each side that is adjustable to fit tire sizes of within 20” to 29”. The best thing is its two hitch size options: The 2” and the 1.25” so that you can pick the most suitable to your vehicle construction. Last up, is their lifetime warranty to give you more confidence in the purchase. 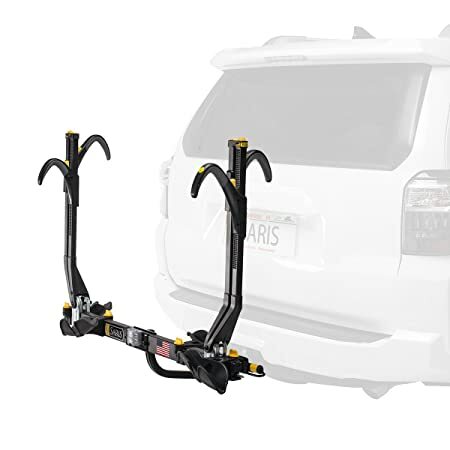 The Yakima Products Hold Up is another platform-style bike rack that focuses on loading your bikes in the fastest, easiest way without touching the frame. Whether it’s a 29” wheel or a 20”er, the StrongArm design helps with a quicker load of your vehicles with zero contact to their frame. In comparison to other same-style counterparts, this one highlights with stronger performance due to its beefed-up arm pivot. And besides, you can adjust the bikes side to side to prevent unwanted bike-to-bike interference during travel. One consideration is their weight limit of 60 lbs. PER BIKE, which is synonymous a 120-lb capacity. Conversely, the rack itself is amazingly lightweight (only 49 lbs.) to stow away in the back of your car or trunk when not in use. Note that this is a 2-bike rack but an optional +2 attachment are allowed. And as a result, is up to 4 bikes at a time. Another worth-considering hanging rack on this collection, the Critical Cycles Lenox 4-bike mounting capacity with familiar L-shaped frame. 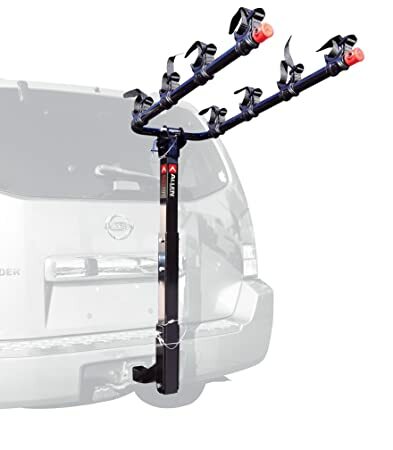 Like the Allen, this mount rack can easily access to your vehicle’s rear even when it’s loaded fully. But before picking the product, remember to check if your car/truck have an IV 2-inch or class III hitch to match with it. Customers who love the Critical Cycles Lenox also comment on its individual cradles. They are attached on each rack arm to deliver extra protection from unwanted contact with the metal rack. Besides, is worry-free operation thanks to the tie-down straps. Take note that it can withstand a total max weight of 80 lbs. with a 2-bike capacity. Thus, the weight of each bike is leveraged up to 40 lbs. Great! 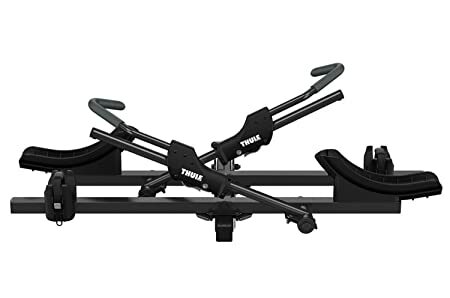 The first platform-style rack with an attached easy-to-use lever on our list, this Thule T2 Pro XT emphasizes its tool-free installation and easy removal process. This innovative design also comes up with special ratcheting arms to avoid contact with the metal frame. At the meantime, they are able to match with wheels sizing 20” to 29” in diameter. Fitting isn’t a matter for this rack because both bike mounts are adjustable side to side. And plus, the integrated cable lock secures your bikes in place. Though the carrying capacity is 2 bikes, with an optional add-on, the number can be up to 4, as long as you attach a 2” hitch into it (sold separately). 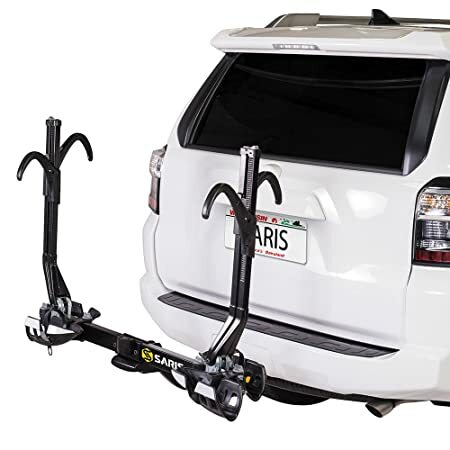 The Kuat Racks, with emphasis on the re-designed pivot and its integrated foot assist, allows you to pivot the bike rack with your foot as needed. Thus, ensure an easier process of loading or unloading. It’s crafted fully from premium aluminum to assure you the decent lightness. Though the rack just comes in a modest capacity of 40 lbs. that can’t be built up to a 4-bike carrier, it can hold firmly two bikes with ease. Fans of the Kuat Racks Sherpa 2.0 also give compliments for its tool-free assembly and the low-profile design. Take note that there are two available assembly options of the hitch size: The 1.25” and the 2”. 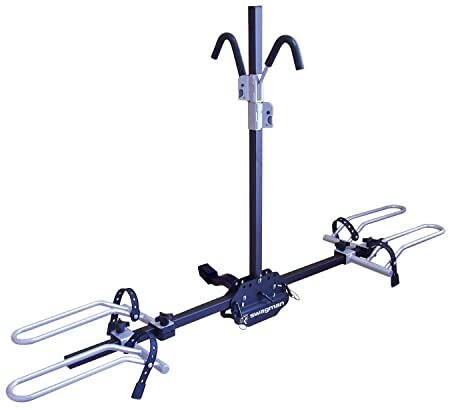 The Saris Freedom SuperClamp is the second platform-style rack with side-by-side wheel clamps on our list. And, it’s a worthy contender to feature one of the most stable with no-frame contact tray racks available on the market. Though lightweight, it can carry two bikes (maximumly 32 lbs./each) of any types and the integrated locks keep them secure during travel. It’s rather easy to install as well as to use. Just tilt it down to access your car/trunk rear or fold it up for storage. Despite a small extra detail, the reflectors are very appreciated for visibility improvement when you drive at night. Lastly, it’s 100% USA-made. The Kuat Racks NV 2.0 shares the same DNA as the Kuat Sherpa 2.0. It inherits all available strengths from the previous lines, such as the newly redesigned pivot system with an additional foot assist, the molded cup, and the front tire ratchet system. At the same time, there are many advanced features added. First, the NV 2.0 carries more weight (up to 60 lbs.) and it can take an add-on unit to build up to a 4-bike carrier. Second, with an adapter, this bike can handle a wheel’s diameter up to 29” – much bigger than usual. Third, your bike will be held securely without wobbling due to the well-built locks. And finally, the integrated trail dock work stand allows some adjustment before departing. 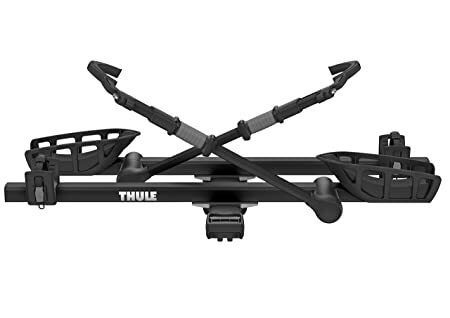 One of the most unique selling points of the Thule T2 Classic is the fact that it can fit a wide range of wheels’ diameter (within 20”-29”) and tires up to 5” with no adapters needed. On the other words, whether it’s a mountain, carbon frames, fat or downhill bike, this robust rack can carry like a breeze with no bike-to-bike interference guaranteed. It’s a big thank you for the rack mounts. They allow you to fully adjust your bike before travel and the frame-free ratcheting system protects bikes rapidly with no frame contact. Another bonus is the HitchSwitch lever that can be tilted down to keep the carrier away from your car/trunk whenever you want to access its rear. Saris is well-known for their two major lines: The Superclamp and the Superclamp EX. 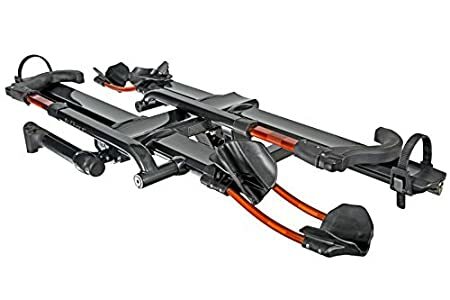 And this version is highly recommended for those people who are finding a bike rack with wider tire trays and additional reflector for better visibility when driving at night. But the biggest difference between two of them is the EX allows you to fold up and tilt away from your vehicle for easier rear hatch access, even when it’s loaded fully (same operation as the Thule T2 Classic above). Contrast to its lightness, this rack can handle easily two bikes weighing up to 60 lbs./each. That’s amazing! 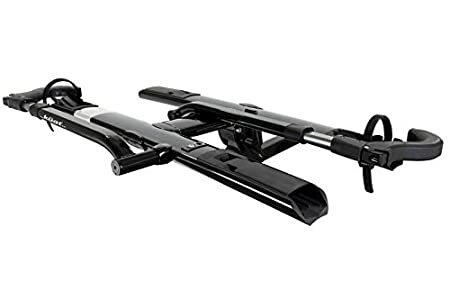 Additionally, its integrated locks help each bike stay in place securely and combine with the dual wheel-camping hooks, you can avoid bike-to-bike interfere or frame contact optimally. 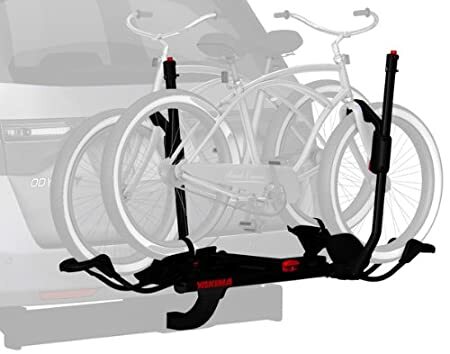 The Yakima Holdup Tray Style is designed as a two-bike rack but you absolutely enable to double that capacity up to 4 thanks to the 2” Yakima Holdup. The product is also foldable to store in your car/trunk when not in use. And, it can be tilted down (even when fully loaded) to access your vehicle’s rear with no interference. Not only strong, but the rack is also flexible to fit any wheel’s diameter (from 20” to 29”). Plus, it retains a certain space from bike to bike to save them from unexpected scratches. If you’re wondering about the rack’s weight, don’t get shocked, it’s only 32 lbs. I guess that’s one of the reasons people love it – very easy to assemble or remove. The Kuat Trio Rack comes in two color options (Black & Silver and Gun Metal Gray & Orange). Whichever you choose, they will give you two service choices: With or without expert installation. Of course, the added installation package will cost some extra fee, but it keeps your hands free as well as avoiding improper installation. The Kuat Trio Rack might have distinctive construction than other counterparts, it’s a wonderful fork mount roof rack that you can attach to any axle types and carry a wide range of bikes. In comparison to other wheeled lines, the Trio Rack is arguably the high-end version to be stronger, easier to use, and more durable. The only minor drawback is it doesn’t include boost hub adapters. Hope the manufacturer can fix it in the future. Most buyers of the Yakima Dr. Tray appreciate its phenomenal ability to prevent the potential for bike-to-bike interference. By giving unrivaled spacing between bikes which is up to 18”, you can rest assured of intact bikes (even the fat ones) during travel. Another big bonus is you can adjust your bikes while they are loaded with no tools needed. Hence, the change is done quickly and conveniently. If you want to tilt down or raise up the rack for easier rear hatch access, its easy-to-use remote control will make it cooler and more convenient. Take note that Dr. Tray can handle a range of wheel’s diameter of 26” to 29” whilst the tires are up to 5” wide. The only 180-degree swing-away platform style to make our list. By this new model, it highlights the superior compatibility with bike’s wheelbases within 34”-49”, securing them by the front wheel without contacting with the frame. In terms of the wheel’s diameter, it should be within 20” to 29” and the tires are maximumly 5” wide. Though this new design limits in a capacity of 2 bikes with no ability to built up with add-on unit, it’s super strong to hold up to 60 lbs./each. And still, deliver 2” adjustment to prevent bike-to-bike interference. On top of that, no wobble bolt at all! It also allows you to tilt down 30 degrees for easier rear hatch access or when not in use, just fold it flat against your car/trunk. Easy, right? In terms of styles, this is a biggie. There are three options with its own list of benefits that you need to touch on before making an informed purchase. 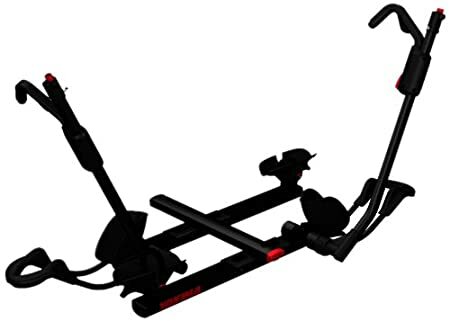 -Hold bike firmly in place without wobbling or touching the previous frame. -Easy to install the rack and its accessories. 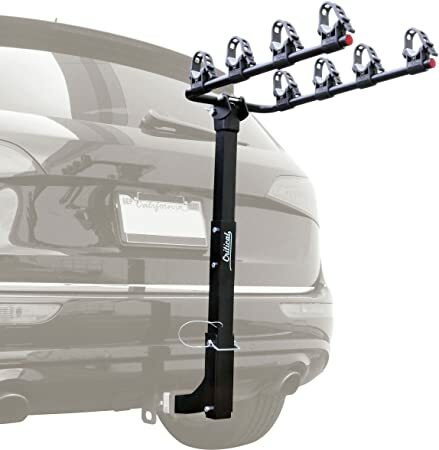 -The most protective rack to save your bikes from danger caused by other cars on the road. -Carry many things, not just bikes. Whichever you choose, you need to refer the manufacturer’s fit guide to ensure that rack is compatible with your vehicle. You can access this information on their respective websites. What is the maximum weight of a rack that you still enable to carry, lift up or bring down? Do you intend to assemble it on your own or need help from other members? Is its lightweight enough to be stowed away in your vehicle when not in use? And about the weight capacity, it’s closely related to the number of bikes you usually carry for travel and how much weight of each? Since there are many bike types out there, it’s essential to ensure your new rack can fit with the type of your bike. From my experience, the standard men’s bikes are perfect to mount on a hitch rack while the kid’s and the women’s might require for special adapters, especially if your choice is a hanging rack. Lastly, never mount a racing bike with a carbon fiber frame on the hanging-type rack. It’s scratched badly for sure. This last feature depends on where you live and ride to consider choosing a rack with locks to deter bike thieves. But it is optional. If you stick with your bikes and racks all the time then consider one without locks to save more money. As you wrap up this phase of research, I hope that my selected suggestions and additional buying guide have helped your focus. Whichever you pick from my collection, quality and functionality are no worries. Just remember to consider what you’re looking for in a bike rack to find the right one meeting your need. And finally, thanks for reading!